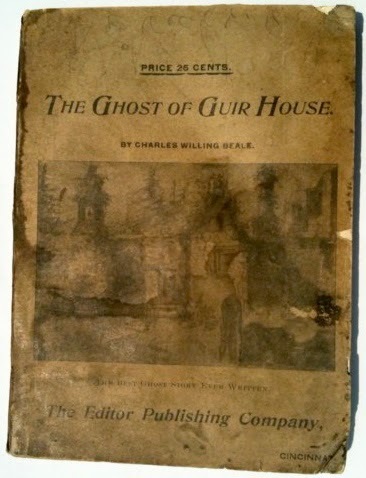 Charles Willing Beale’s 1897 short novel The Ghost of Guir House is a ghost story but it also belongs to the category of esoteric occult fiction that was so popular in the late 19th century and in fact until well into the 20th century. Charles Willing Beale (1845-1932) was an American who led a rather adventurous life and was apparently renowned for various impressive feats of strength (he was clearly one of those writers who believed in living a life of action). As well as The Ghost of Guir House he also wrote a science fiction novel, The Secret of the Earth. The Ghost of Guir House is heavily influenced by the strange but immensely popular Theosophical speculations of Madame Blavatsky. The novel combines a ghost story, and a rather good one, with a good deal of spiritual and metaphysical philosophising about the nature of reality, the conquest of death and the links between the spirit world and our world. This might sound like a dubious combination but in practice it works quite well. The shortness of the novel is a major asset and even if you find the spiritual stuff to be a bit silly it doesn’t really hold up the action too badly. The story starts with Paul Henley, who receives a letter from a young woman named Dorothy Guir. He has never heard of her or her family and in fact the letter had been intended for a different Paul Henley but he decides to answer it anyway. He arranges to meet her at an obscure railway station in a remote part of Virginia. They then travel to her home, Guir house, a place that for some inexplicable reason seems to be shunned by the locals. Guir House is gloomy but oddly impressive and it has a very old-fashioned feel to it. Dorothy explains that it was built more than a hundred years earlier and it has more of the feel of the 18th century than of the late 19th century. Dorothy herself dresses in a fairly archaic style as well. Henley is not perturbed by this - the isolation of Guir House is enough to explain why it and its inhabitants seem like relics from the past. Apart from a deaf-mute servant Guir House has only two inhabitants, Dorothy and a very old man known somewhat mysteriously as Ah Ben. Ah Ben certainly has some strange notions, which he expounds to a perplexed Paul. Paul and Dorothy are obviously attracted to one another but Dorothy’s behaviour is rather puzzling. She talks of marrying Paul but hints at mysterious obstacles to their marriage. There are clearly secrets in Guir House but they are much stranger than Paul suspects, and probably stranger than most readers will suspect. Even if you don’t buy into the Theosophical stuff and even if you find some of the events to be somewhat bizarre and outrageous there’s still a decent ghost story here and the book is certainly original and weird and generally fairly entertaining. This short novel (really more a novella) is included in Dover’s excellent anthology Five Victorian Ghost Novels, edited by E. F. Bleiler. It was published in 1971 but it appears to be still in print and used copies are easy to find. The Ghost of Guir House is oddly fascinating. Highly recommended if only for its strangeness. Malice Aforethought, published in 1931, is generally regarded as Francis Iles’ masterpiece, and with good reason. Iles was in fact a pen name used by Anthony Berkeley Cox(1893-1971) who also wrote detective fiction under the name Anthony Berkeley. Malice Aforethought is not a conventional mystery novel, since the identity of the murderer is disclosed on the very first page. This was a technique that had been used earlier by R. Austin Freeman, who described it as the inverted detective story. In Freeman’s hands the technique was used to place the emphasis on the way the detective solves the crime. Iles uses it for slightly different purposes - his concern is with the psychology of the murderer. Dr Bickleigh is a popular and well-respected country general practitioner in the tiny English village of Wyvern’s Cross, but he is not happy. He is dominated by his wife, and the fact that she is his social superior makes this even more intolerable (the novel dates from 1931 when the class divide in Britain was still an immense and unbridgeable gulf). He compensates for his sense of inferiority by seducing as many of the women of Wyvern’s Cross as he can. An unfortunate liaison with yet another woman from a higher social class brings Dr Bickleigh’s discontent to head and he decides that life with his wife Julia has become unendurable. Murdering her seems to be the best possible option. Iles gives us a disturbing glimpse into the mind of a man who is so outrageously self-centred that he no longer has any sense of morality at all. He lacks any kind of adult understanding of the world. It’s a novel that fully lives up to its reputation as one of the classics of crime fiction. Highly recommended. 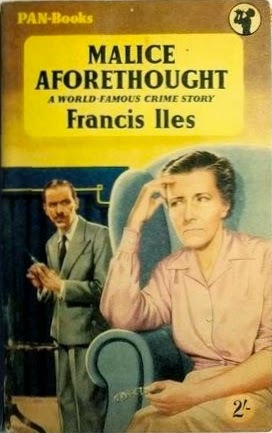 The other well-known Francis Iles crime novel, Before the Fact, is interesting although not as good as Malice Aforethought. On the other hand the 1929 Anthony Berkeley mystery The Poisoned Chocolates Case is absolutely superb. 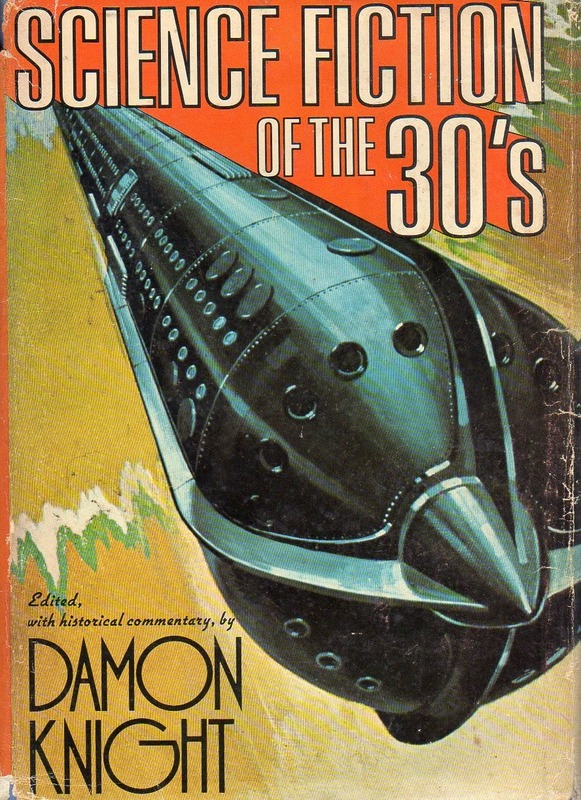 Science Fiction of the 30s is a 1975 anthology edited by Damon Knight, comprising stories originally published in pulp magazines like Astounding. Knight provides us with a brief but fascinating history of the science fiction pulp magazines of the era. While many of the stories do have a rather pulp feel the overall quality is impressive and the stories demonstrate the enormous vitality of the genre at that time. The writers were not afraid to tackle the big subjects and they were not constrained by preconceptions regarding the kinds of subjects that were suitable for treatment. They gave their imaginations full rein. Robert H. Wilson’s Out Around Rigel shows just how ambitious 1930s science fiction could be, involving as it does the difficulties of faster-than-light travel and the problems posed by relativity theory. Pretty impressive for a story dating to 1931. In Murray Leinster’s The Fifth-Dimension Catapult experiments with non-Euclidean geometry prove to be rather dangerous when a scientist and his daughter are trapped in the world of the fifth dimension. This is another story that shows just how quickly science fiction writers picked up on revolutionary new theories like quantum physics and relativity. Meddling in non-Euclidean geometry becomes even more hazardous when gangsters are involved. Frank K. Kelly’s Into the Meteorite Orbit reminds me just a little of Rudyard Kipling’s classic 1905 science fiction story With the Night Mail. John W. Campbell’s The Battery of Hate tells the story of a young man who invents a source of virtually unlimited incredibly cheap electricity, a power source so efficient it can be used to power cars and aircraft. Not everyone is happy about this new invention and one wealthy financier is prepared to go to any lengths to prevent it from reaching the marketplace. This is a very pulpy story but thoroughly enjoyable. There are two stories by Howard W. Graham. The Wall is quite bizarre - a scientist invents a paint that creates an enormous wall of force that cuts Manhattan Island in two. The Other is the tale of a beautiful alien woman entombed in ice for 40,000 years. But is she really dead? And what is the strange object she is holding that looks a little like a ray-gun? David H. Keller’s excellent The Lost Language involves a boy who cannot speak, although he can write. The trouble is that he writes in a completely unknown language known only to himself. An inventor sets out to find a way to turn the boy’s writings into speech. Frank Belknap Long’s The Last Men is an oddly poignant story of a world in which gigantic insects treat humans the way we treat butterflies. Stanley G. Weinbaum seemed to have a liking for the creation of extremely strange but fascinating aliens. The Mad Moon feature two alien races, inhabitant of Jupiter’s moon Io. Io is also home to humans such as Grant Calthorpe. The humans have only one interest in Io - the ferva plant which has countless medicinal uses. Life on Io has many challenges, not the least of which is the dreaded white fever which brings hallucinations and madness. Raymond Z. Gallun’s Davey Jones’ Ambassador is another lost civilisation beneath the sea tale, but an intriguing one. A story of two civilisations with nothing in common apart from curiosity. In the creepy and rather chilling Alas, All Thinking Harry Bates gives us the story of a scientist who sees the future of the human race and it’s enough to make him give up science. The Time Decelerator by A. Macfadyen is one of the many stories in this anthology dealing in various ingenious ways with time travel. In W. K. Sonnemann’s weird but intriguing The Council of Drones a man changes places with a queen bee and leads a war of the bees against the human race. Seeker of Tomorrow by Eric Frank Russell and Leslie T. Johnson returns to the subject of time travel, on an epic scale. A late 20th century scientist jumps forward to various futures, sees the results of destructive wars, sees magnificent civilisations and finally ends up on Venus (the human race having by this time emigrated to that planet). The one problem is - he can only go forwards in time, never backwards. The later stories, from the tail end of the 30s, seem to move away from the cool science concepts towards whimsicality and sentiment. L. Sprague de Camp’s Hyperpilosity is too whimsical for its own good while his The Merman deals with a man who accidentally learns to breathe water but again the story seems to be striving for amusement rather than amazement. Manly Wade Wellman’s Pithecanthropus Rejectus borrows ideas from The Island of Dr Moreau although its more immediate inspiration was probably the Tarzan stories (and movies). It’s quite a moving and effective story. Lester del Rey’s The Day Is Done is a gently melancholic tale of the last Neanderthal. Compared to today’s science fiction these stories are notable for a lack of interest in bludgeoning the reader with political messages. Some stories do have a message but they’re not heavy-handed. There’s a degree of optimism in these stories although it’s balanced with perhaps more scepticism than the science fiction of the later golden age. All in all an excellent and extremely varied anthology demonstrating the genuine diversity of the genre in its earlier days. Highly recommended. There have been some pretty good television series based on the detective novels of the golden age. Recent attempts have generally been conspicuously unsuccessful or even outright disasters but back in the 1970s these things were often done surprisingly well. 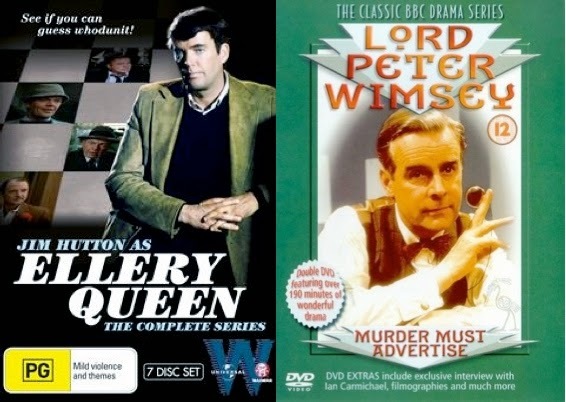 Two of my favourites were the Ellery Queen series starring Jim Hutton which aired on NBC in 1975 and 1976 and the 1970s BBC adaptations of Dorothy L. Sayers’ Lord Peter Wimsey mysteries with Ian Carmichael as Lord Peter. For anyone who’s interested I’ve reviewed both the Ellery Queen and the Murder Must Advertise episode of the BBC Lord Peter Wimsey series on my Cult TV blog. 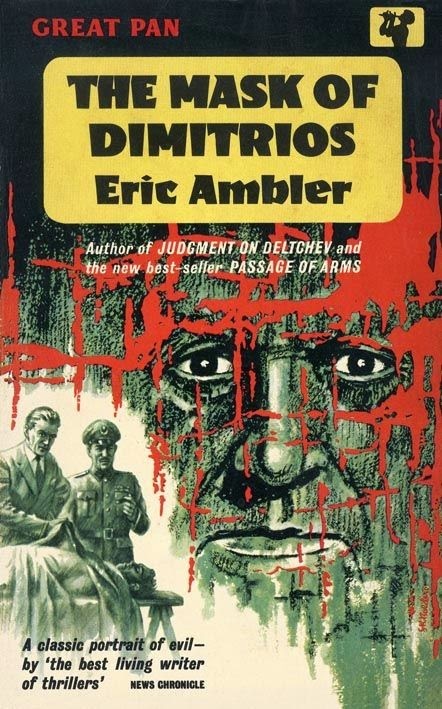 Eric Ambler’s 1939 novel The Mask of Dimitrios (published in the US as A Coffin for Dimitrios) is a true classic of the crime/espionage genre. Charles Latimer is a mild-mannered writer of detective stories on holiday in Istanbul. He makes the acquaintance of the head of the Turkish secret police, Colonel Haki, who happens to be a fan of crime fiction. Colonel Haki shows him the body of a real murderer, a mysterious man known as Dimitrios who has been sought by the police in half a dozen countries over the course of the preceding two decades. Latimer becomes obsessed by the idea of doing some real detective work on his own initiative, trying to untangle the truth about the life and crimes of Dimitrios. Latimer’s amateur detective work takes him to various European cities, where he meets an assortment of shady but fascinating characters who have been associates of the dead criminal. Dimitrios has dabbled in white slaving, drug dealing, robbery, political assassinations and espionage. Latimer’s quest turns out to be more interesting than he expected, but also a lot more dangerous. Although Dimitrios is dead, he dominates the book, as Latimer slowly pieces together the details of his lively but violent career. Latimer is a great character as well, in a book that abounds in colourful characters like the enigmatic Mr Peters. It’s a stylish, gripping and highly entertaining tale, brilliantly plotted and executed with tremendous elan. An absolute must-read. The Davidson Case, published in 1929, was one of the early Dr Priestley detective novels written by Cecil John Charles Street (1884-1964) under the pen-name John Rhode. It illustrates some of the author’s great strengths as a mystery writer while also suffering from some fairly serious weaknesses. John Rhode was one of the authors contemptuously dismissed by critic Julian Symons as belonging to the Humdrum School of detective fiction. My own view is that Symons was quite wrong about these writers in general and very wrong about Rhode in particular. I’ve found the Dr Priestley mysteries to be anything but humdrum. The Davidson Case is not however one of his better efforts. Sir Hector Davidson is the head of a chemical engineering firm. The firm was built up by his father and grandfather but Sir Hector is running the company into the ground. He cares about nothing other than extracting as much money from the company as possible in order to finance his dissolute lifestyle. His cousin Guy Davidson has been watching Sir Hector’s activities with despondency for several years. Guy really does care about the company and about its employees. He is a research chemist himself and has a genuine passion for the subject. When Sir Hector is found dead no-one is very upset. In fact there is a general sense of relief. His cousin Guy Davidson, who now succeeds to the baronetcy and who will now control the firm’s fortunes, is as relieved as anyone. The circumstances of Sir Hector’s death are peculiar. He had been returning to his country house. On arrival at the railway station he had been surprised that his servant was not waiting for him with the car. He engaged the services of a local carrier to transport him in his van to his home. He was found dead in the back of the van, stabbed to death by a rather curious improvised stiletto. It is not an impossible crime but finding a theory that will adequately account for the circumstances is a challenge even for Dr Priestley. The local police are baffled. When Chief Inspector Hanslet of Scotland Yard is called in he can make little progress either until Dr Priestley puts forward a theory that seems watertight. Or is it? The murder method is certainly ingenious. It’s exceptionally complex but it is worked out in intricate detail and it hangs together remarkably well. The problem lies in the solution. There are a couple of factors in this case that are just a bit too obvious. Rhode is careful to provide most of the clues necessary for the solution but the alert reader is almost certain to spot the main points of this solution. It also has to be said that the story relies a little too heavily on the police failing to follow up certain very obvious lines of inquiry, and in order to keep the issue in doubt the author perhaps is guilty of holding back some important information until rather late in the day. Once this information is revealed the solution is straightforward. Rhode was usually very skillful in his plotting but on this occasion he was obviously aware that had he not held back this information the explanation of the crime would have been all too obvious. One interesting feature of Dr Priestley as a detective is that his only interest in crime is the purely intellectual interest it provides. If he is able to solve the crime to his own satisfaction he is perfectly content. Whether the criminal is brought to justice is of no concern to him. The Davidson Case provides an example of this approach that is slightly startling for a novel published in 1929. A Hercule Poirot would certainly not have approved of Dr Priestley’s indifference to the matter of seeing that justice is done. If you have not sampled any of John Rhode’s Dr Priestley mysteries then I strongly urge you to do so but The Davidson Case is definitely a lesser effort. The Venner Crime, The Claverton Mystery and The Motor Rally Mystery are on the other hand quite superb examples of golden age detective fiction while Dr. Priestley Investigates is rather outrageous fun. The Uninhabited House was originally published in Routledge’s Christmas Annual in 1875 and thereafter remained fairly obscure until it turned up in the 1971 E. F. Bleiler-edited anthology Five Victorian Ghost Novels (published by Dover Books). The author, Mrs J. H. Riddell (1832-1906), enjoyed considerable success in her lifetime. She wrote around fifty novels and short story collections and this output included a respectable number of tales of the supernatural. The Uninhabited House is, not surprisingly, a haunted house story. The narrator is Patterson, a young clerk in the London solicitor’s office of the kindly Mr Craven. Mr Craven’s most extraordinary, and most troublesome, client is the formidable Irishwoman Miss Blake. Miss Blake is imperious, querulous, selfish and manipulative. Most solicitors would have urged her to take her business elsewhere but Mr Craven cannot bring himself to take this step. Oddly enough his clerks, although all have suffered at Miss Blake’s hands, would be very disappointed were he to do so. The truth is that Miss Blake makes life a lot less dull than it might otherwise be. She is strangely repellant but strangely fascinating. Miss Blake would be a challenging client in any circumstances but matters are made more exasperating by the matter of her house. The house was left to her by her widowed sister and the letting of this house provides the bulk of the modest income on which Miss Blake and her niece subsist. It is easy enough to find tenants for the house. It is, on the face of it, an attractive and desirable residence. The problem is that no tenant ever stays more than a few weeks, and several have vacated the house within a few days. The house displays all the symptoms of a classic haunted house - unexplained noises, doors that mysterious open and shut, lights that go on and off in impossible circumstances and worst of all apparitions for which no explanation can be found. Matters come to a head when the latest tenant flees the house and a law suit ensues over the matter of the lease. 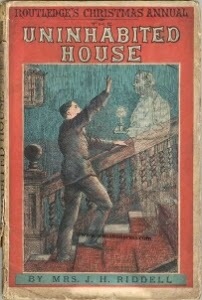 In desperation young Patterson volunteers to stay in the house himself in order to solve the mystery. He has been offered fifty pounds to do so but he has a stronger motivation than money - the chance to prove himself to a certain young lady. The plot is, to be honest, a fairly routine Victorian ghost story. Its saving grace is that it is a particularly well written story. Mrs Riddell is skillful enough at creating atmosphere but more importantly she has a ready, one might even go so far as to say sparkling, wit. In the person of Miss Blake she has created a grotesque but perversely engaging comic character of almost Dickensian proportions. A modern reader is unlikely to find this short novel to be in the least terrifying but it is consistently amusing. The Victorian ghost story, and even more particularly the Victorian ghost story written for publication in one of the special Christmas editions of popular periodicals, was after all intended as civilised family entertainment. Judged in this light The Uninhabited House succeeds quite well. Recommended for fans of the traditional ghost story. In a career spanning more than four decades Christopher Bush (1885-1973) wrote sixty-three mystery novels featuring his series detective Ludovic Travers. His books were published in the US as well as in his native Britain and were translated into various European languages. He was clearly a very successful writer in his day. He is now, sadly, almost completely forgotten and all his mysteries are out of print. The Case of the Second Chance was the thirtieth of the Ludovic Travers novels, appearing in 1946. Travers belongs to the category of what might be called semi-professional fictional detectives. As a gifted amateur he had assisted Detective Superintendent George Wharton on several cases and had demonstrated his usefulness to the point where he ended up working with the police in a semi-official capacity. In fact in The Case of the Second Chance he becomes a more or less official policeman. The structure of this story is interesting. The investigation takes place, intermittently, over the course of no less than four years. It all starts during the war. Travers is serving in the British army. In 1942 he is home on 14 days’ leave and naturally he looks up his old friend Detective Superintendent Wharton. Things are quiet at Scotland Yard, but not for long. Soon Wharton is called in to investigate the murder famous actor-producer Charles Manfrey. Naturally enough he suggests that Travers might like to tag along and Travers jumps at the chance. This is one of those murder cases in which the police are faced with too many suspects. Everyone who knew Charles Manfrey disliked him, and most of those who knew him disliked him enough to kill him. The problem is that all the most promising suspects have watertight alibis. The investigation looks promising for a while but eventually leads nowhere. The case is not closed but it is put on indefinite hold and unless some startling new evidence turns up it seems destined to remain unsolved. This is however a case that never quite goes way. A couple of years later some new evidence does turn up, but it proves to be another dead end. In 1946 both Wharton and Travers have more or less forgotten the Manfrey murder case. Travers is now back in civilian life and he plans to start a private inquiry agency with his old friend Wharton. Actually they are intending to take over an existing agency. Wharton had always intended to retire once the war was over but he had no intention of being put out to pasture altogether. With Wharton’s retirement from Scotland Yard still a few months away Travers has already started to learn the ropes of the private detective business. His first case seems fairly routine - a woman who is being blackmailed is afraid to go to the police so she puts the matter in the hands of Travers. Much to his surprise Travers soon realises that this case may have some connection to the long-dormant Manfrey murder case. In fact the link seems promising enough to bring Wharton in on it in his official capacity. This is a fairly standard example of the golden age detective story and fits neatly enough into what Julian Symons disparagingly called the Humdrum School. In fact the writers of the Humdrum School were generally speaking extremely proficient practitioners of the art of the detective story, with the emphasis being very much on plotting (which accounts for the disdain of misguided critics like Symons). 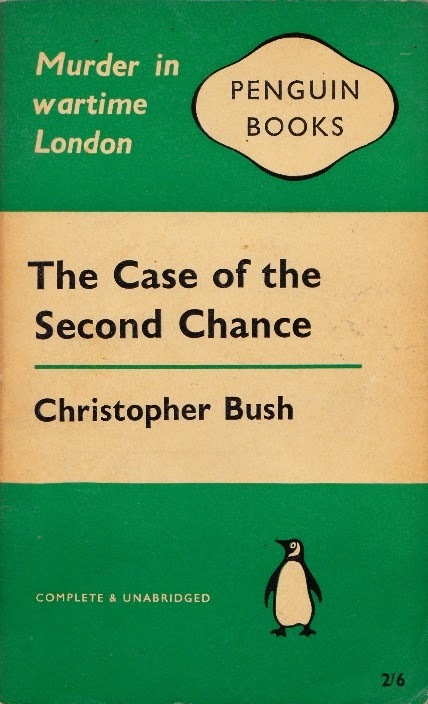 Christopher Bush was a very proficient practitioner indeed of this art and here he gives us a delightfully intricate puzzle plot with the added bonus of multiple unbreakable alibis. Travers serves as the narrator and he offers us an Ellery Queen-style Challenge to the Reader. He goes further than that - he repeats the challenge several times. An author has to have a remarkable degree of confidence in his plotting to do something like that and Bush’s confidence is not misplaced. Bush does employ several plot devices that modern critics would regard as being rather dated. Even in 1946 they were devices that seemed a little old-fashioned (and I’m not going to offer any hints as to what these devices are). Personally I don’t find this to be problem. What matters is the skill with which they are employed and Bush has the requisite skill. I’d go so far as to say the novel’s old-fashioned feel is a definite asset - it adds to the fun. Travers and Wharton make an effective and engaging detective team. Travers is wealthy, well-educated and decidedly upper-class and he holds the fashionably radical political views that go along with these attributes. Wharton was a working-class boy who pulled himself up by his bootstraps and he naturally holds unfashionably conservative views. They are polar opposites in style, outlook and temperament but this has only served to strengthen their friendship and their mutual esteem. The good news is that Bush does not allow politics to intrude into the story at any point and the even better news is that this book is entirely free from social comment. The Case of the Second Chance shares the theatrical setting of the author’s earlier (and superb) The Case of the Tudor Queen. In both books this setting is more than just a colourful background - it plays a crucial part in the plot. The Case of the Second Chance is top-notch entertainment and can be highly recommended to fans of the golden age detective novel.